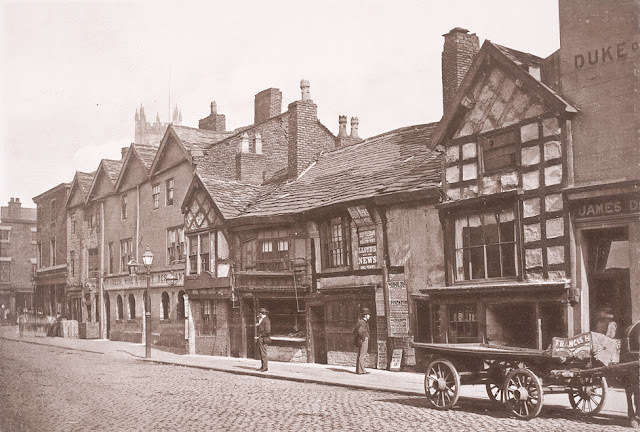 Salford has a long and unabashed tradition of destroying its patrimony. This 1822 drawing depicts the Salford Cross (described elsewhere in this blog) two years before its demolition. 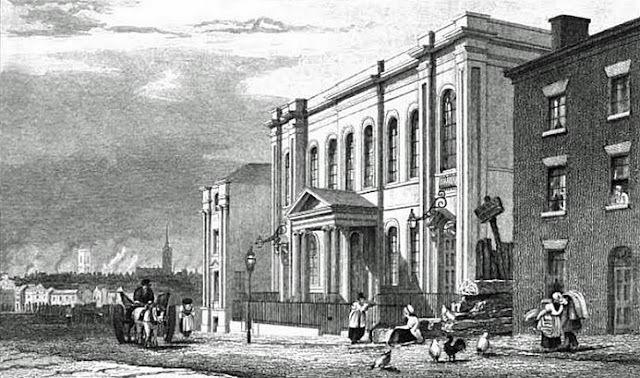 The illustration is based on the work of John Ralston (1789-1833) , who struggled to make a living as an artist. He was a cultured, gentle and retiring man, but lacked the art of self-promotion, and consequently died penniless in the workhouse. 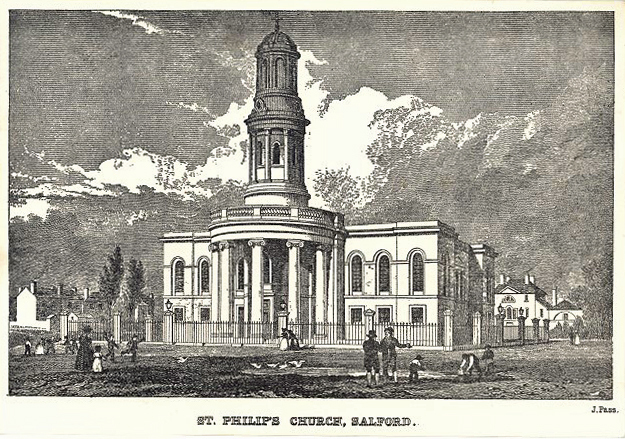 He was buried on 5 November 1833 at St. Stephen's Church, Salford, which, with the exception of Sacred Trinity, was the oldest church in the city. Now, before you dash off to pay homage at St. Stephen's Church, it too has been demolished, but there is a quiet garden, located between Lamb Lane and St. Stephen Street that was once the church's graveyard. This burial ground was consecrated in 1817. Some of the best pictorial records of late 18th and early 19th century Manchester rely on drawings made by Ralston, including his many studies of Market Sted Lane (now Market Street). 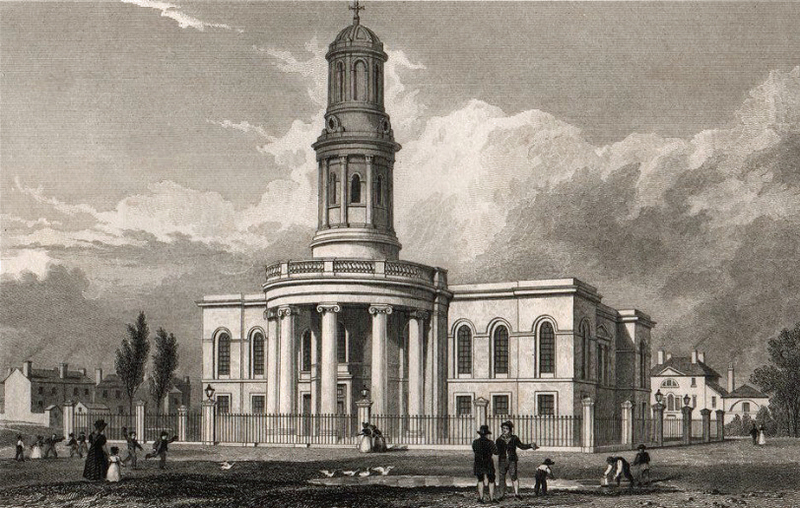 The Church of St. Philip was built by Sir Robert Smirke in 1825. The illustration above is from a study by Thomas Allom (1804-1872), and engraved by John Pass (fl.1796-1829). It was originally produced for W. H. Pyne's ""Lancashire Illustrated", from original drawings... London: Fisher, Son & Co., 1829. Also from Lancashire Illustrated are engravings of the Salford Town Hall (page 100); the Irwell Street Methodist Chapel (page 84) and the New Bailey Prison (page 72). 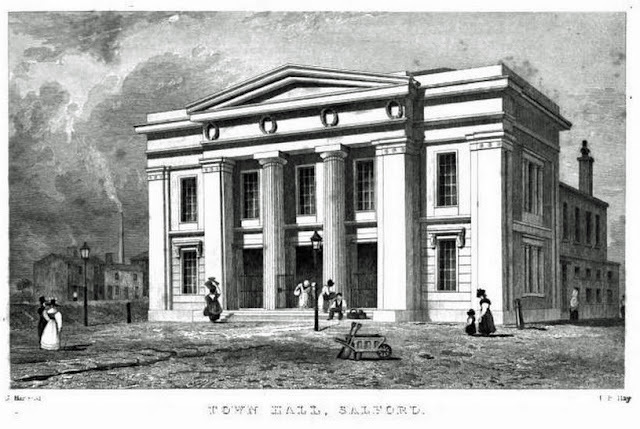 The depiction of Salford Town Hall is the work of topographical draughsman, John Harwood, and was engraved by Frederick Rudolph Hay of Edinburgh. 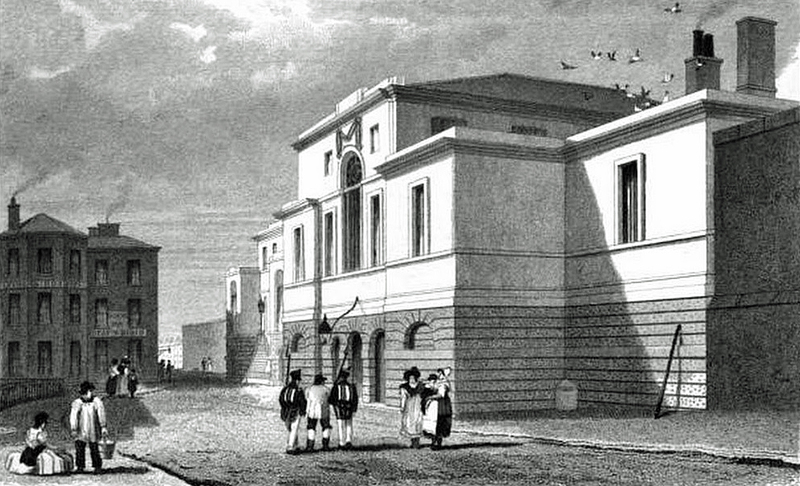 Engraved by J. Davies (i.e. John R. Davies (fl.1829-1843) ; Drawn by S[amuel] Austin. 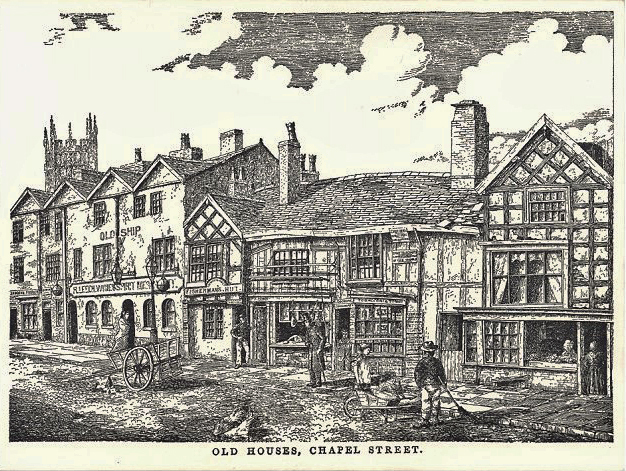 The drawing above is the work of Thomas Ashworth, and is one of the illustrations included in his book, Sketches of old Manchester and Salford, published in 1877 for the Royal Jubilee Exhibition held in Manchester to mark Queen Victoria's 50th year on the throne. One particular area in the exhibition grounds was dedicated to "Old Manchester and Salford", consisting of full-scale replicas of buildings from the past. 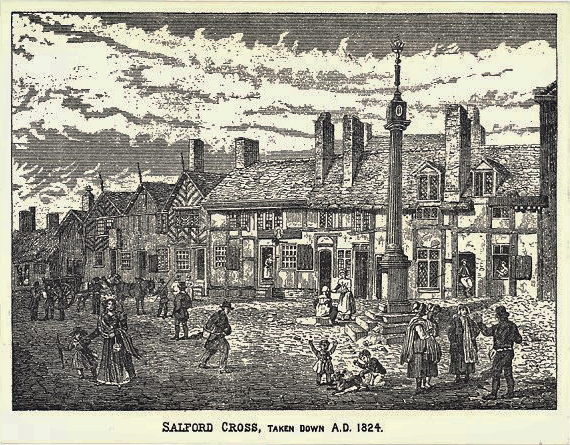 Salford Cross was included, and visitors could walk through the reconstructed street. Photograph of the buildings that inspired Ashworth's illustration. This area was demolished in the 1890s. 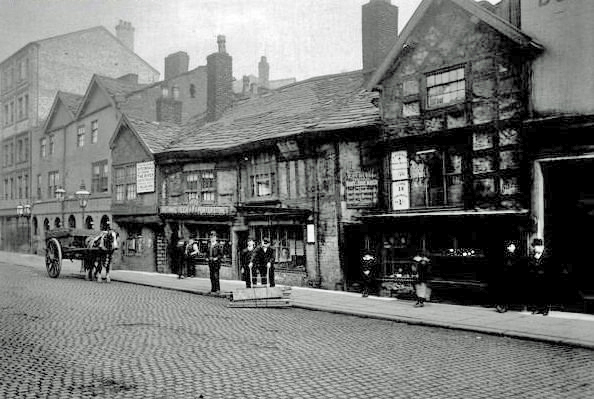 We are looking at the south side of Chapel Street, anciently known as Sergeant Street. 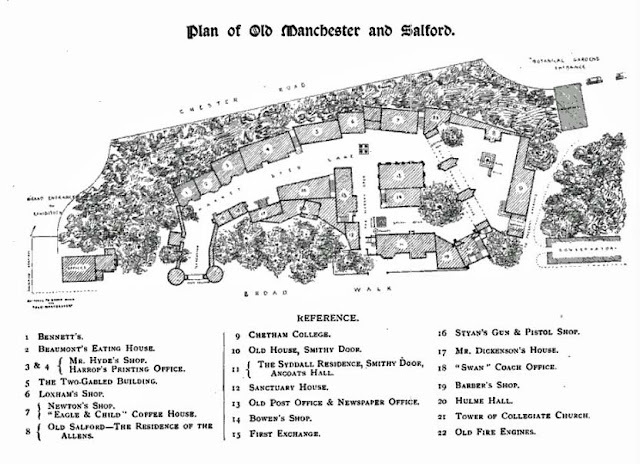 It has been suggested that part of the building behind the two gentlemen, particularly the Fisherman's Hut, which can be seen in Ashworth's drawing, was a remnant of Salford Hall (not to be confused with Ordsall Hall). 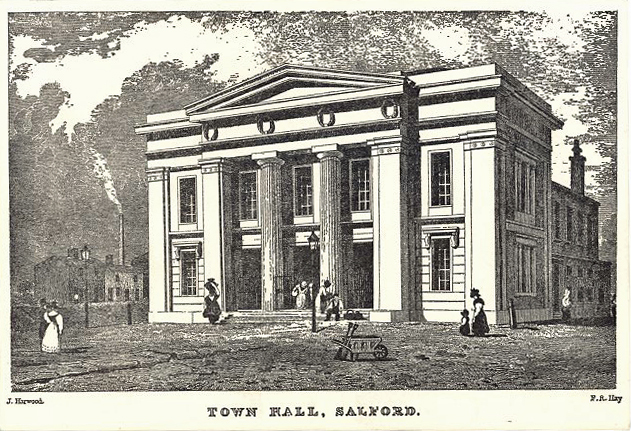 Ralston is described as a 'drawing master', and lived at 26 Brazennose St., Manchester according to the Palatine note-book, vol. 3:54-5. This could be W. Henshall, engraver, active 1830-50, or J. Henshall, engraver, active 1828-50.